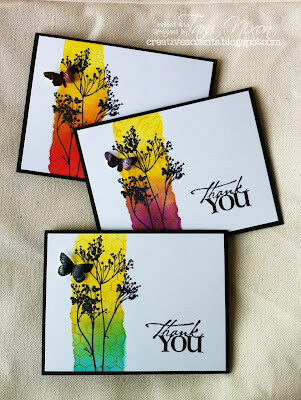 Today I have a pretty simple card to share, but it features that fun technique Tim Holtz shared at Creativation using Distress Oxide on Glossy Alcohol Ink paper! I have his video to share with you- it starts out with introduction of the new colors and the technique starts around 6:45- check it out! The sentiment is from Dina Wakley, it was just a perfect fit for the space I had left and I was very happy to find that Archival Ink worked on the glazed surface (when I didn't have too much glaze, that is!). If you're still fully immersed in winter (which I know most of my friends in BC, and across Canada are), I hope this card brings a smile to your face and the hope of spring... at least we have our inks and craft supplies to brighten our day, no matter the season or the weather! I'm linking this card up over at Simon Says Stamp for National Craft Month (since I missed the "In Your Garden" challenge by like 2 minutes. oops). This caught my eye immediately. What a gorgeous background. Must watch Tim's video. And the way you turned it into a card is perfect. Yes, very Spring-y.